The movie follows the story of three mystical apprentices named Balthazar, Morgana and Maxim. During the age of mystics a great struggle began when Maxim betrayed his mentor, Merlin, and joined forces with an evil sorceress named Veronica. Veronica has plans to take over the world and kill any who oppose her. Merlin and his apprentices Balthazar and Morgana try to intervene but are subdued by Veronica's powers. Veronica invokes a spell that allows her to take over the body of Morgana and kill her from the inside. To stop this Balthazar (Nicholas Cage) must trap both of them within a mystical vase. During the battle Merlin is mortally wounded, and as a part of his last request he gives Balthazar a dragon ring that will tell him who will be his successor. In the year 2000, Balthazar runs into a young man named dave, who he recognizes as the successor, so he gives the ten-year-old the ring. The ring instantly wraps around his finger, proving he is the true successor of Merlin. Before having time to train the boy Maxim and Balthazar battle it out within the museum, which causes them to be placed within an urn that confines them for ten years. Ten years later the young man named Dave is now a college student who has been outcast by most of his classmates and struggles to keep a grip on reality. Unknown to Dave it has been ten years since he was given the ring, and the two sorcerers that were trapped in the urn are now free and looking for him. Balthazar finds and trains Dave in the ways of the mystic arts. While Maxim is traveling around the city raising an army to help with the return of Veronica. At the final battle Maxim releases Morgana (and Veronica trapped within her body). This leads to Dave accepting his powers and defeating the evil sorceress. 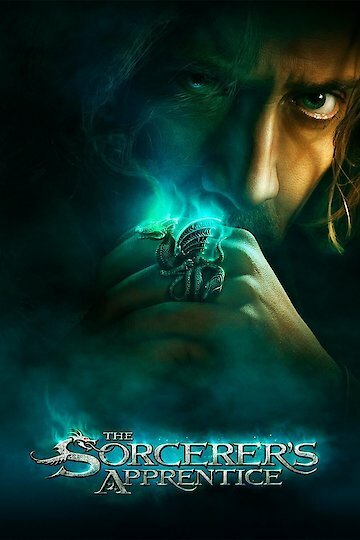 The Sorcerer's Apprentice is currently available to watch and stream, buy on demand at Amazon, Vudu, Google Play, iTunes, YouTube VOD online.